NEW YORK — David Hockney turned 80 in July. That’s a milestone for anyone. With Hockney, it inspires cognitive dissonance. Part Pan, part Puck, he’s been the most youthful of artists for as long as he’s been making art. A sly, grinning intelligence has informed a six-decade-long cascade of paintings and prints and drawings and photographs. The portrait of the artist as perpetually young man even extends to physical appearance: the moon face, the round specs, the thick thatch of hair (once bottle blond, now white). “David Hockney,” the career retrospective that runs at the Metropolitan Museum of Art through Feb. 25, presents a talent continually restless, eager, buoyant. Hockney’s commitment to figuration and established modes testifies to a profound traditionalism (though not conservatism). His commitment to playing with figuration and reworking those modes testifies to a no less profound radicalism. Consistent, discernible style is a small miracle. Who can say why or how one emerges? But when it does, a viewer knows it: Distinctiveness is what makes a style more than just a set of aesthetic gestures. A larger miracle, and much rarer, is when that distinctiveness alters yet endures. This is the greatest pleasure the Hockney retrospective offers. The work of the proto-Pop artist in pre-Swinging Sixties London so visibly differs from the cool, quiet canvases of the newfound painter laureate of Los Angeles. Those paintings so visibly differ from the ’80s grids and collages by the mosaic-inspired photographer (“inspired” in both senses), which in turn so visibly differ from this century’s post-Fauve landscapes of Hockney’s native Yorkshire. Yet all are unmistakably products of the same hand, eye, and imagination. 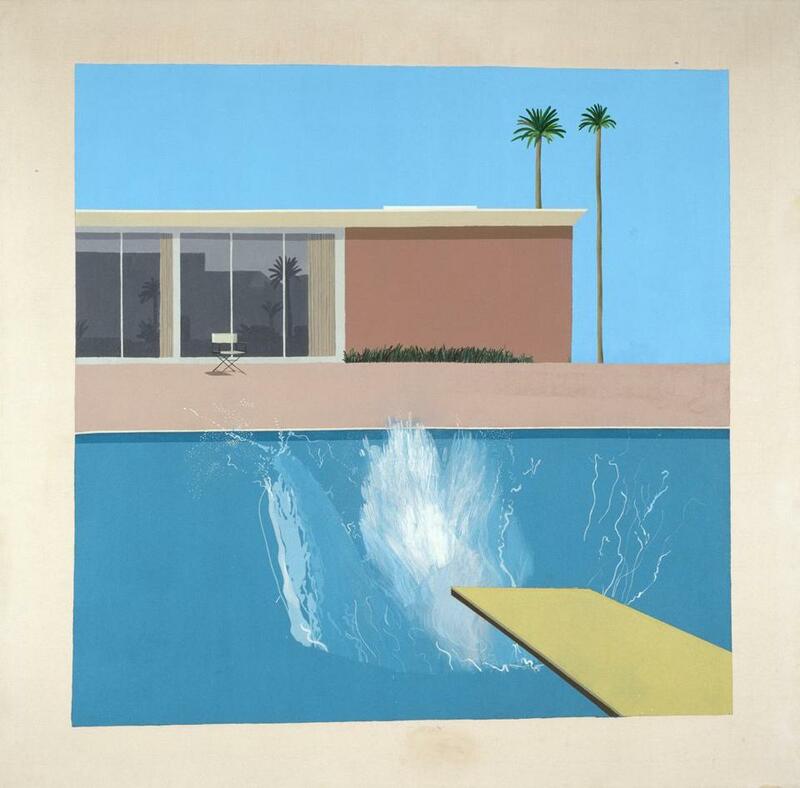 It was in Los Angeles that Hockney achieved stardom — an appropriate word for a career that almost from the outset combined celebrity and achievement — and “A Bigger Splash” remains his most famous work. Seeing it in person is a minor revelation. The sheer painterliness of the white spray raised by a seconds-ago dive can’t be appreciated in reproduction. That said, Hockney is one of those painters, like Klimt, who loses little in reproduction, surely a contributing factor in his vast popularity. The exacting threadiness of the white paint reminds you of how widely Hockney has absorbed influences over the years and made them his own: not just Pop and color-field painting and Matisse (as colorist) and Picasso (in line) and Cubism (his perceptual experimentations with the camera), but, as here, Abstract Expressionism, too. He’s the rare artist for whom art history is neither burden nor black hole but standing invitation. Reproduction also makes it easy to overlook the painting’s dun borders, a subtly deadpan reminder that this paradisal patch of chlorinated water sits in the middle of a desert. Hockney’s visual ebullience can make it easy to overlook his intellectual ebullience. Granting that even a large retrospective has limits, it’s regrettable that neither Hockney’s opera designs nor his writings on art history, technique, and perception get more than a few passing references. For the most part, the show proceeds chronologically. Even if it didn’t, the move to Los Angeles would declare itself — not just in terms of subject matter (don’t look for outdoor pools or palm trees in London), but also with a stripping down of visual elements and the difference in light. Maybe that’s Hockney’s truest affinity with Matisse: Their imaginations reside in a realm made of Mediterranean light. What doesn’t change is the sense of assurance. Because they’re the least-familiar part of the show, the 20 or so early works are the most eye-opening. 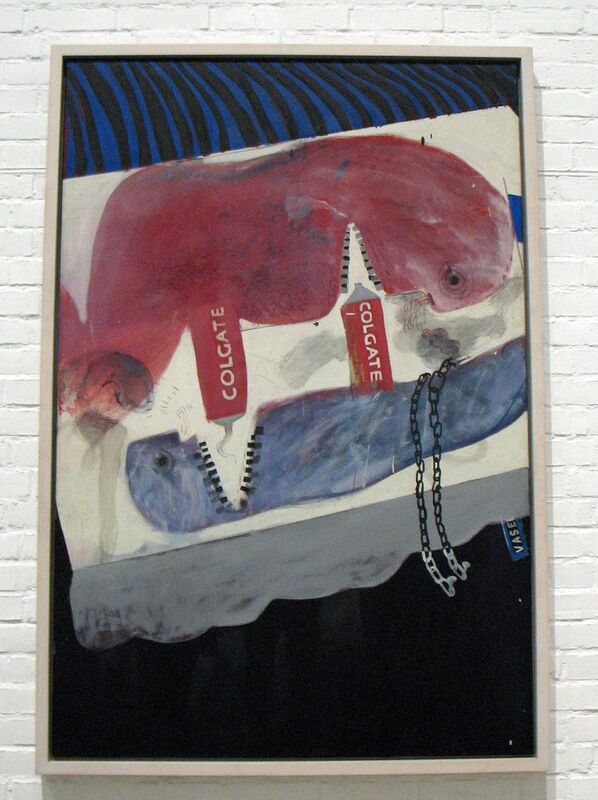 It’s plain how much the young Hockney drew on Francis Bacon and Richard Hamilton. Soon enough he left them behind. Just as plain is the confidence that imbues each canvas. Given paintings may be cluttered or a bit clumsy (neither word often associated with Hockney). None are hesitant. That’s true thematically no less than visually. Hockney’s willingness to deal with gay subject matter at a time when homosexuality was illegal in Britain is startling. His casualness about it is even more so. The way he substitutes tubes of Colgate for phalluses in “Cleaning Teeth, Early Evening (10pm) W11” is at once hilarious, brazen, and bravura. 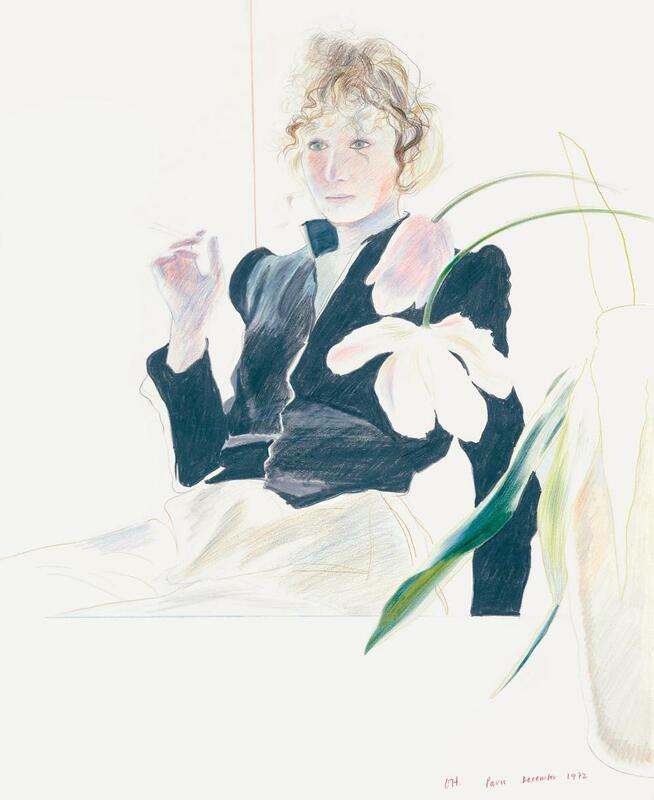 After Los Angeles, the show assembles groupings of Hockney’s drawings and double-portrait paintings. The drawings are pure pleasure: a froggy-looking W.H. Auden, in 1968; the nonchalant mastery of line in a rendering of his dealer, John Kasmin, in bed, from a year earlier; the list goes on. Like the drawings, the portraits show Hockney the psychologist. The famous portrait of the writer Christopher Isherwood and his partner, the artist Don Bachardy, is a collision between simple geometry (the play of rectangles and planes) and not-so-simple emotion (the interplay between the two men). The English landscapes of the last two decades have a rich, almost-throbbing color. These sites are nowhere near any desert. 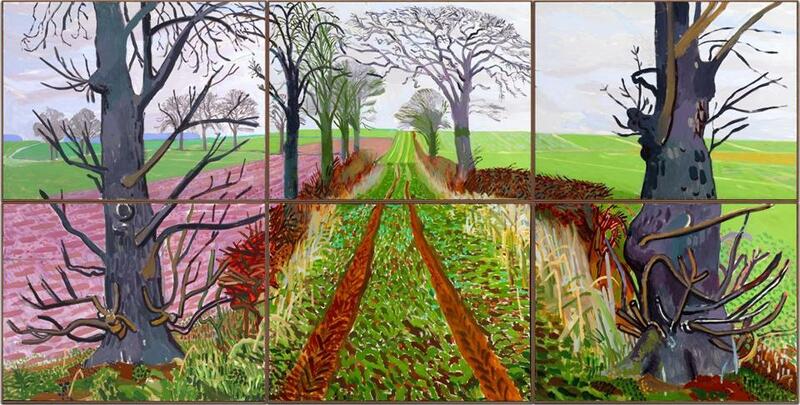 “A Closer Winter Tunnel, February-March,” from 2006, is a precis of Hockneyan visual concerns: the thrumming palette (even in winter), the passage of time (note the title), the formal inventiveness (rather than a single canvas, it’s six joined panels). Hockney’s been drawing on an iPad for a number of years. When in Yorkshire, he got in the habit of keeping one by his bed and each morning recording what he saw outside his window. A three-channel video installation shows dozens of these drawings: rich in color, even by Hockney standards, simple in arrangement. For parents interested in exposing their children to art, here’s an ideal vehicle. These images are that delightful. Some, which show a drawing’s progression, verge on the magical. This appeal to the young makes sense. At the core of Hockney’s art is something childlike: not innocent (hardly that), but abidingly curious and almost athletically open to experience. Even at 80, that innate youthfulness remains. Especially at 80, it sustains.